Snedigar Sports Complex fields 4 and 5. 4001 S Alma School Rd, Chandler, AZ 85248 8am-11am $175 per player before May 1st. ($195 after May 1st.) Registration information coming soon. North Sevier Middle School soccer field. 657 Forest Highlands Dr. Flagstaff, AZ. 86001 9am-12noon $210 per player per week. (Fee includes C.E.S.C. ball and t shirt) Contact Kurt Martin (Forest Highlands Director of Recreation) to register for the camp. Please note: this camp is only open for residents of Forest Highlands and their guests. This camp is open to residents of Pine Canyon and their guests. Contact Bianca Haggenmuller, Camp Pine Canyon to register for this camp. All players aged 5-18. Players will be grouped according to age. Full day camp is only open for players aged 10 and up. All full day campers need to bring their own lunch as it is not provided by the school. 1/2 day camp is $175 per week (Before May 1st.) $195 after May 1st. Contact: Ed Callaghan (602) 214 0780 or email edc@callaghansoccer.com with questions. All full day campers need to bring their own lunch as it is not provided by the school. 1/2 day camp is $175 per week (Before May 1st.) $195 after May 1st. July 29th-Aug 2nd Greenwood Village, CO.
(602) 214 0780 with questions. C&C Park Soccer Club Soccer Camp. 9am-12noon $180 per player before May 13th. Please note this camp is open to Stevenson School students aged 5-18 only! Ed Callaghan (602) 214 0780 with questions. 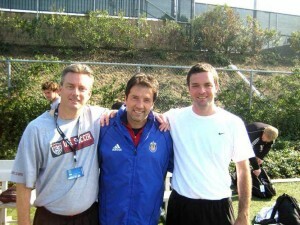 Ed Callaghan (left) pictured with US 1998 World Cup star and 2 time MLS MVP, Preki (center). We will continually update this page with new event information as it becomes available. Please contact us as soon as possible to reserve the best dates for your community soccer camp!